The Cuban government prohibits leaving the national territory without prior government authorization. “Illegal exit” is punishable with one to three years in prison and financial penalties.2 The term balsero (“rafter”) typically depicts Cubans who escape or attempt to escape from their island-country usually in makeshift rafts, small boats, and other primitive vessels. Some are able to command seaworthy vessels, often owned by the State, and in recent years, a growing number of escapees have been leaving in fast boats operated by smugglers. For the sake of simplification, this paper refers to any person who flees Cuba by any sea-faring means as a balsero. The phenomenon of Cuban balseros greatly increased after 1989, when Cuba’s economy took a nosedive with the collapse of Soviet Communism and the loss of massive Soviet economic support for its ailing socialist, centrally-planned economy. The number of desperate Cubans willing take to sea even in the most precarious of vessels grew progressively as the economy spiraled downwards.3 From 1989 onwards, the number of arrivals to the U.S. jumped exponentially from the 239 who had arrived in the entire period 1983-1988. The total peaked in 1994 with a mass exodus of over 37,000, encouraged by the Cuban government, after which Migration Accords between Cuba and the United States brought new rules into play that have impacted the nature of the sea exodus as well as arrivals. In 1994 and 1995, to halt a mass sea exodus, the United States entered into two migration agreements with Cuba whereby it regularly interdicts and returns to the island balseros who have not made it to U.S. territory or dry land. Other countries neighboring Cuba—such as Bahamas, Grand Cayman (a British territory), Honduras, Jamaica, and Mexico—also routinely return Cuban asylum-seekers arriving mostly as balseros. Many other countries, notably European nations where Cubans arrive by other means, have returned an undetermined number of asylumseekers to the island while providing political asylum in certain circumstances.10 The erratic and inconsistent nature of these practices point to unresolved international legal issues—with respect to refugee law as well as in relation to human rights and humanitarian law—and to other considerations that merit exploration. This paper will address this matter primarily in terms of the United States, with due reference to implications for the international community. Since Cuba’s struggle for independence from Spain, the United Sates has provided refuge to Cubans who, at one time or another, have opposed their government. The first significant migration of Cubans to the U.S. began during the second half of the 19th century. By 1890, 20,000 Cubans had settled there; by 1910, this number had doubled to 40,000. Between 1950 and 1958, years that encompass the Batista dictatorship in Cuba, 50,950 Cubans were said to be living in the U.S.11 Yet, Cuba had been a nation that took in immigrants, including from the United States, at a much higher rate than its people emigrated until January 1, 1959, when Fidel Castro came to power after dictator Fulgencio Batista fled the country. Instead of holding promised free elections and restoring the 1940 Constitution, Castro initiated a rapid and violent transformation of Cuba’s society, economy, and political system into Communist totalitarianism. Fleeing the country quickly became, and has remained, a primary pursuit of many of Cuba’s citizens. Between 1959 and 1999, 1,079,000 Cubans are reported to have left for different countries. Today, the total Cuban population residing abroad is estimated to surpass 1.4 million (compared to the current island population of around 11 million12 and over 6 million when Castro came to power). The United Sates has been, by far, the safe haven of preference for Cubans. According to the 2000 U.S. census, in that year approximately 842 thousand Cubans had been welcomed and offered asylum by the United States since 1959 (Table 1). Geographical proximity, a close historic relationship, and strong cultural ties, together with the United States’ humanitarian disposition, its strong anti-Communist stance, and an “open arms” policy of taking in all Cubans fleeing Communism, explain this. The availability of more resources for refugees, the existence of better overall opportunities, and a large Cuban exile community make the United States the most appealing destination for Cuban emigration. In addition, due to the nature of currents in the Florida Straits, the majority of Cuban balseros can position themselves to drift towards the U.S. mainland, with Key West, Florida, a mere 90 miles from the closest point in Cuba. Because of the large Cuban-origin population in South Florida, it has also been difficult to control U.S.-based persons from going by boat to pick up loved ones when the Castro regime has allowed it. In 1980, the traumatic mass sea-bound migration from Cuba known as the Mariel boatlift brought over 124,000 undocumented Cubans to the United States,18 including a number of “undesirables” (mostly criminals and persons with psychiatric illnesses19) purposefully shipped off by the Cuban government.20 As a result, the United States suspended normal immigration until 1984, when an agreement was negotiated whereby Cuba would take back a number of Mariel migrants found to be “excludable” under U.S. law and the U.S. would allow up to 20,000 Cubans into the U.S. each year through “orderly” and “legal” immigration channels.21 This was the first time the “open arms” policy that had existed since 1959 was officially modified. Cuba suspended this agreement in May 1985 following the initiation of Radio Marti (Voice of America) broadcasts by the United States to the island, but it was reinstated in November 1987. The crisis prompted the Clinton Administration to enter into two Migration Accords with Cuba to end the mass exodus. A September 1994 agreement “to direct Cuban migration into safe, legal and orderly channels” committed the U.S. to issue travel documents to a minimum of 20,000 Cuban migrants each year24 while Cuba pledged to discourage irregular and unsafe departures. The agreement also called for regularly reviewing the migration situation and the implementation of the accords. A May 1995 companion accord established that Cubans interdicted at sea or entering the U.S. Naval Base at Guantánamo (considered “wet foot”) are returned if they do not have “a demonstrable and well-founded fear of persecution.” Interdicted Cubans who meet the criteria are resettled in third countries as refugees.25 Refugees reaching U.S. soil or dry land (“dry foot”) are typically paroled considered for special admission) into the United States as per the Cuban Adjustment Act of 1966.26 As part of the agreements, Cuba agreed to reintegrate returnees into Cuban society, with no action to be taken against the returned migrants for their attempt to emigrate illegally. The U.S. Interests Section was to monitor Cuba’s compliance with that provision, which it did until March 2003 through regular visits to the homes of returnees throughout the island. The 1951 Convention on Refugees recognizes only two limitations for claiming non-refoulement. Article 33 states that it may not be claimed by someone seen as a risk to the security of the country or who had been convicted of a “particularly serious crime.” The International Law Commission (ILC) Draft Articles on State Responsibility further provides that a breach of an international law obligation is justified in extreme cases of necessity. The latter is defined as a situation that endangers an “essential interest” of the state and places it in “grave and imminent peril.” Only then can a state invoke necessity as a justification. A roundtable of international legal experts, concerned with a trend of exceptions to human rights principles, concluded in July 2001: “Exceptions must be interpreted very restrictively, subject to due process safeguards, and as a measure of last resort. In cases of torture, no exceptions are permitted to the prohibition against refoulement.”53 Concerns over terrorism are particularly significant, particularly after 9/11, yet the criteria used to protect a state and its citizens against potential terrorist activities may be overly general, subjective, or less than imminent. On the other hand, as we shall examine further on, the Cuban balsero situation could potentially merit an “essential interest” exception to non-refoulement due to its peculiarities and the historic use of migration “blackmail” by the Castro regime on the United States government. Since 1980, the United States has had in effect legislation that makes its international law obligations applicable in domestic law.64 Various reforms, both legislative and by judicial decision, have been made to the asylum system established by the 1980 Refugee Act. In 1993, the legality of the interdiction and repatriation policy was directly challenged in Sale v Haitian Centers Council,65 which reached the Supreme Court. It argued that the United States was breaching its international law obligation of non-refoulement, enshrined in the Refugee Act by intercepting ships from Haiti and summarily returning them without adequate screening to ascertain whether any of the asylum-seekers had valid claims to refugee status. The Supreme Court decided in favor of the federal government in interpreting the non-refoulement principle to only apply once an asylum-seeker had entered the United States. The “wet foot-dry foot” policy is a derivation of this ruling. No legal challenge is known to have been brought in U.S. courts regarding the interdiction of Cuban migrants or the 1994 and 1995 U.S. Migration Accords with Cuba on the return of balseros. The Cuban case might, for example, merit a different treatment by the courts than the Sale v Haitian if compelling arguments were made that the Cuban Adjustment Act and the “wet foot” policy are considered de facto recognition of Cubans’ condition as political refugees66 and/or if it is recognized that returnees generally face “torture” or “persecution,” as defined by the CAT. The U.S. government considers that Coast Guard procedures afford adequate protections. A Coast Guard officer reports that “cutters have at least one person who speaks Spanish to interview Cuban balseros—a Spanish-speaking crew member or someone temporarily assigned in the absence of one.”74 All balseros are individually “pre-screened,” with written notes taken to document their interviews, typically lasting 10-15 minutes.75 This report does not make it apparent that the individuals are trained interpreters or have any specialized instruction for this task. Nevertheless, the State Department’s Coordinator for Cuban Affairs asserts: “A specially-trained Alien Pre- Screening Officer (APSO) from the Department of Homeland Security/Citizenship and Immigration Services (DHS/CIS) travels to any Coast Guard cutter which has conducted an interdiction. These APSOs are all fluent Spanish speakers, in most case possessing native Spanish, and all have up-to-date familiarity with the current political and human rights situation on the island. After the balseros are individually ‘pre-screened,’ case files are transmitted by fax to DHS/CIS headquarters in Washington for individual review and final decision. CIS headquarters can and does request additional and clarifying information from the Department of State, the U.S. Interests Section, or consults public sources before making final determinations. Additional interviews can also be directed.”76 If the person claims asylum or a credible fear of persecution, the interview is more extensive and, if there is such a determination, the person is taken to the Guantanamo U.S. Naval Base with any accompanying close family members. Additional screening is conducted there to determine whether a “well founded” fear of persecution or torture exists. If the claim is validated, the person and his or her accompanying family are typically given asylum by a third country, such as the Dominican Republic, which has agreed to take them in. Most interviewees are repatriated to Cuba, but those with serious medical conditions, who may not be given treatment at sea, are evacuated for treatment to the U.S. with any immediate family members, where “dry foot” procedures apply.77 Very few balseros end up in the United States. A State Department official explains that “because a refugee claim is individual, not collective, Cubans seeking to come to the United States are given the opportunity by U.S. authorities to establish if he/she personally would face persecution based on his/her individual actions. Therefore, the process in place for vetting interdicted migrants is considered to comply with the United States’ international obligations. The vast majority of interdicted Cuban migrants makes no claim of political persecution or fear thereof if returned to Cuba, but rather indicate that their decision to attempt illegal migration was driven by the desire for economic betterment. Over 95% do not even attempt to make an argument for political asylum. They say they wish to go to the United States to get a job.”78 This view implies that Cuban balseros could be generally regarded as economic migrants. But, it can be argued that the economic motivation to leave Cuba cannot be disassociated from the reality of repression, which permeates every aspect of life and denies basic economic rights to most citizens. In fact, the U.S. State Department’s 2002 annual report on Cuba’s human rights situation recognizes that “Castro exercises control over all aspects of life through the Communist Party and its affiliated mass organizations, the government bureaucracy headed by the Council of State, and the state security apparatus.” 79 The Heritage Foundation/Wall Street Journal’s annual Index of Economic Freedom, which systematically examines ten factors for each country, consistently classifies Cuba among the “most repressed” countries in the world in terms of economic freedom—keeping company with Belarus, Tajikistan, Iran, Uzbekistan, Turkmenistan, Laos, Burma, Zimbabwe, Libya and North Korea.80 In Cuba, the government regulates the entire economy by owning and controlling the means of production, including setting virtually all wages and prices,81 and employing the vast majority of the labor force. Private ownership of land and productive capital by Cuban citizens is strictly limited to farming and self-employment,82 and only in extremely limited degrees. Regarding labor issues, the State Department 2002 report notes that all legal unions were government entities—their leaders selected by the Communist Party—that collective bargaining does not exist and that workers’ lose employment for their political beliefs. But, what’s more critical is that the “dry foot” policy essentially represents a “collective” approach to the question of asylum, thus, making the “individual” approach applied to “wet foot” situations a puzzling contradiction. The repatriation agreements point to a practical issue that calls for placing the international legal argument within a wider and necessary context. While humanitarian and legal considerations call for taking in refugees in most circumstances, host countries face legitimate practical problems in accepting refugees. This is particularly true in situations of mass influx, which constitute an “undue burden” in terms of security, welfare resources, and others.88 For this reason, the preamble of the Refugee Convention recognizes that hosting large refugee populations can pose an unduly heavy burden on certain countries and calls on states to cooperate to assist host countries and seek solutions to refugee situations. Cuba uses migration to derive considerable benefits. It provides an escape valve to release internal pressure that could otherwise find expression in growing uncontrollable departures that destabilize society, opposition to the government, or popular discontent that could challenge to the power structure. Also, it diminishes the demand on social services, which the state is so hard pressed to rationalize. Importantly, the 20,000 visa allocation is a precondition the Castro government has insisted on forcefully in order to guarantee huge economic benefits from a steady flow of exiles.95 In late 1993, the Cuban government legalized the holding of dollars, which until then had been forbidden and entailed prison sentences. The ensuing economic transfers from exiles has been critical to keeping the Cuban economy afloat and maintaining the current regime in power. Travel complicates things further in a manner that goes to the very heart of the question of asylum. In the 1990s, with the demise of massive Soviet assistance to Cuba, the Cuban government earnestly began to welcome back Cuban exiles to visit family on the island in an effort to bring in hard currency through tourism, tourism-related revenues, cash, and other gifts for family and friends. Even those who leave Cuba “illegally,” with minor exceptions, are accepted back with open arms, allowing them access and privileges they lacked when they were residents. The trend was also fueled by the increased relaxation of travel restrictions by the U.S. government to facilitate family reunification for humanitarian reasons, which was only recently scaled back by the Bush Administration. 105 As a result, growing numbers of U.S.-based persons of Cuban heritage (citizens or residents) have visited Cuba. From 1990 to 2003, the number of travelers of Cuban heritage who visited the island is estimated at almost 850,000, with the most recent arrivals displaying the highest propensity to travel. Most were born on the island and were accepted into the United States as refugees.106 Conditions for exiles that go back for visits and those for residents of the island are very different and there are typically no grounds for them to fear persecution or torture when returning. Yet, this illustrates the inherent contradiction in the claim of political asylum and the ability to travel back fearlessly to the home country where persecution or torture has been presumed. Many, in fact, travel back right after they request their permanent residence status a year and one day after arriving, as per the Cuban Adjustment Act. Finally, the balsero issue cannot be examined without taking into account that the United States faces a unique set of circumstances influencing its handling. On several occasions, as we have seen, the Cuban government has removed restrictions on leaving the country to invite a mass exodus to the United States. This has been amply described in descriptive and analytical studies of several instances of Cuban mass exodus during the Castro regime. Holly Ackerman and Juan Clark have identified a pattern by which the Cuban government fuels migration crisis to obtain internal benefits (such as releasing mounting citizen pressure to leave and a build-up of internal dissent, and identifying the disaffected elements of society), and, ultimately, concessions by the U.S. government that provide benefits to the Castro regime.107 The fact that the Castro regime holds and may use this card is an important component of the complex issues affecting U.S.-Cuba policy in general and cannot be seen independent of this fact. Importantly, due to the strong sentiments of the population of Cuban heritage in the U.S., its traditionally high political participation and activism, and the importance of South Florida in electoral politics, the community’s views and interests are taken very seriously by politicians in developing Cuba policies. These may, generally or at times, be at odds with other policy considerations. All of these considerations coalesce to make the balsero issue a particularly challenging problem to address coherently and justly. Notwithstanding the essential need to develop and maintain adequate human rights’ standards, the repatriation of Cuban balseros by the U.S. and other countries must be examined within a framework that includes the complicated web of issues intimately intertwined of a legal, humanitarian, and political nature. Thanks to the steady development of international refugee and human rights law of the last fifty years, the individual has come to be recognized as the inherent bearer of human rights.108 “The failure or inability of the country of origin to fulfill its responsibility to safeguard human rights has become a matter of international concern and responsibility, even of humanitarian intervention.”109 Thus, in the context of international law, the Cuban balsero issue is not merely a U.S. “problem.” Yet, international law and the international community have been, to date, woefully lacking for attention nor effective and enduring solutions to the Cuban migration problem. This failure raises more fundamental question regarding the denial of rights that drives Cubans to escape their country. How should individual governments as well as the international community effectively deal with a state whose citizens seek fundamental freedoms even at peril to their lives while their government is willing to use their desperation as blackmail and for its own profit?110 What is the responsibility of the international community to the people of Cuba, particularly in light of the human tragedy unfolding in the Florida Straits? These questions merit an in-depth exploration that is beyond the scope of this paper—but one that cannot be ignored if the refugee issue is to be addressed responsibly and effectively. 1. Note from the editor: Due to space limitations, a very rich bibliography prepared by the author is not included. It is available from the author on request. 2. Cuban Penal Code, Law 62 of 1987, Chapter XI, Article 216. 3. Reports vary, but it is generally accepted that between 1989 and 1993, the Cuban economy shrunk by at least one third; some analysts believe the decline was much larger. Although the economy has been growing slowly since 1994, it will take many years of sustained economic growth for GDP to reach the 1989 level, when scarcity was already acute and the country’s huge external debt was in default. As a result, essential services, food, and even the most basic consumer goods are acutely scarce for most of Cuba’s citizens. 4. Kevin Whitaker, Coordinator for Cuban Affairs at the U.S. State Department actually reports that “most” of the balsero activity is currently through smuggling. (E-mail of January 12, 2004.) Other sources contradict this, but is impossible to corroborate either way, as systematic recording of balseros who perish at sea has never been systematically or successfully undertaken, inside or outside of Cuba, due to state censure and persecution. In any event, it is plausible to conclude that smuggling activity has been fueled by the “dry foot” practice, to be discussed later in this paper, which allows Cubans who make it to land to remain in the United States, while those interdicted at sea are returned. Arguably, this has fueled the need to find more effective ways to make it to shore instead of being caught at sea and returned to Cuba. See, for example, Ted Henken, “Balseros, Lancheros, and El Bombo: Cuban Immigration to the United States since the 1994 Rafter Crisis and the Persistence of Special Treatment,” prepared for presentation at the symposium “The Balseros Ten Years Later: No Longer Adrift?,” Cuban Research Institute, Florida International University, Miami, July 16-17, 2004. 5. “Calmer seas bring rise in number of Cuban migrants,” Miami, Reuters, June 5, 2001. According to this source, smugglers charge $4,000 to $8,000 for a trip; this makes it an option available almost exclusively to those with relatives abroad willing and able to take on this expense. 6. See cases of balseros’ deaths attributed to smuggling operations in “Calmer seas bring rise in number of Cuban migrants”; Sofia Santana and Luisa Yanez, “Bodies found in Gulf Stream linked to migrant smuggling,” The Miami Herald, August 28, 2002; Alfredo Tedeschi, “Cubans weep for migrants missing in Florida Straits,” Bahia Honda, Cuba, Reuters, August 27, 2002; and Jennifer Babson, “Investigan la muerte de 4 balseros en alta mar,” El Nuevo Herald, 5 de marzo de 2001. 9. Armando Lago, Ph.D., has derived an estimate of 77,814 such victims from data obtained in studies by the Oceanographic Institute of the University of Miami and the University of Havana. (Telephone interview of October 2003 with Armando Lago, Ph.D., Project Director of the Truth Recovery Archive on Cuba, www.CubaArchive.org. This data is from his upcoming book The Human Cost of Social Revolution: The Black Book of Cuban Communism.) Another study, using available estimates of survival rates, estimated in 1995 that over 100,000 may have perished from 1959 to 1994. (Holly Ackerman and Juan Clark, “The Cuban Balseros: Voyage of Uncertainty,” Miami: Cuban American National Council, 1995.) Francisco Chaviano, who attempted to collect this information inside Cuba, was sentenced to 15 years in prison in 1995. There are many media and anecdotal reports of deaths, but the identity of victims is rarely established and a systematic recording of bodies found at sea does not exist. (See, for example, P. Abusleme Hoffman, “Mueren dos mujeres en travesía de Cuba a la Florida,” El Nuevo Herald, 24 de febrero de 2001.) The exact number of victims, or even an accurate estimate, is simply impossible to know under the current circumstances and, in fact, may never be known precisely. 10. See, for example, Rassí, Reynold. “Devuelve Jamaica a 10 inmigrantes ilegales cubanos,” Granma, Octubre 29, 2001; “Spain moves to end asylum requests from Cubans,” Madrid, Spain, Associated Press, March 14, 2002; Rui Ferreira, “Niegan asilo a los 3 cubanos en Francia,” El Nuevo Herald, 15 de septiembre de 2000; Wilfredo Cancio Isla,“Repatrian a 35 cubanos detenidos en Bahamas,” El Nuevo Herald, 28 de noviembre de 2001; and Alberto Núñez Betancourt, “Devueltos 160 emigrantes ilegales en lo que va de año,” Granma, 4 de Junio de 2001. 11. Rolando García Quiñones, Director del Centro de Estudios Demográficos (CEDEM), Universidad de La Habana, “International Migrations in Cuba: persisting trends and changes,” Seminar on Migration and Regional Integration, August 1- 2, 2002. 13. A. Larzalere describes the U.S .government’s mostly unsuccessful attempts to stop Cuban exiles from leaving for Cuba to pick up relatives and family. See Alex Larzelere, The 1980 Cuban Boatlift: Castro’s Ploy—America’s Dilemma, Washington, D.C.: National Defense University Press, 1988. 15. Ruth Ellen Wassem, “Cuban Migration Policy and Issues,” CRS Report for Congress, Congressional Research Service, Library of Congress, Washington, D.C, February 14, 2000. By the end of 2002, 688,639 Cubans had been granted lawful permanent resident status since 1966, of which 654,149 had been granted that status as per the Cuban Adjustment Act of 1966. See Tables 22 and 23 of the 2002 Yearbook of Immigration Statistics, Bureau of Customs and Immigration Services, http://uscis.gov/graphics/shared/aboutus/statistics/ index.htm. 16. 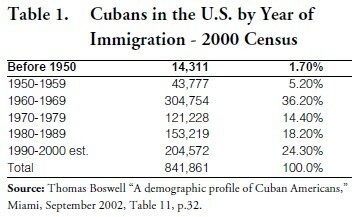 For more on Cuban-American demographics see, for example: Thomas Boswell “A demographic profile of Cuban Americans,” Miami, September 2002; and Silvia Pedraza, “Cuba’s Refugees: Manifold Migrations,” Cuba in Transition—Volume 5, Association for the Study of the Cuban Economy, Washington, D.C., 1995. 17. “Cuba: Migration,” U.S. State Department webpage, www.state.gov/www/regions/wha/cuba/migration.html. In the Fall of 1965, a chaotic period ensued when hundreds of boats left from Miami for the Cuban port of Camarioca, where they picked up thousands of relatives to come to the United States. To normalize Cuban immigration, for eight years until 1972, the United States and Cuban governments administered an orderly air bridge, known as the Freedom Flights. These brought Cubans from Varadero to Miami, processing and resettling the refugees quickly through the Cuban Refugee Program, dispersing them throughout the United States. See Pedraza, 1995. 18. Between April and September 1980, 124,776 undocumented Cubans arrived in Florida , putting tremendous strain on facilities. “Mariel Boatlift,” U.S. Coast Guard, Alien Migrant Interdiction—Coast Guard Office of Law Enforcement. <www.uscg.mil/hq/g-o/gopl/ mle/mariel.htm>. 19. The Castro government also considered homosexuals “undesirable,” and had a policy of encouraging homosexuals to emigrate during the Mariel exodus. The regime had aggressively persecuted homosexuals in the earlier years of the Revolution. The author has received several anecdotal accounts to this effect and conducted an extensive personal interview of a Mariel émigré who left Cuba pretending he was homosexual. Personal interview of 12/31/03 with William Villalobos, who left during the Mariel exodus at age 22, and is a resident of New Jersey currently working as an executive of a New York publishing company. 20. Some Latin American and European countries took in a small number of Cuban asyulum-seekers who had entered the Peruvian embassy. See Larzalere, 1988. 21. An incident of April 9, 1980 in Havana, had provided the setting for the Mariel Boatlift. Six Cubans commandeered a bus and crashed the gate of the Peruvian Embassy in Havana to seek asylum. Cuban guards opened fire on the bus and a ricocheting bullet killed one of the guards. When the Peruvians refused to turn the asylum-seekers over to the Cuban authorities, Fidel Castro announced that those who wanted to leave could do so. Several thousand Cubans descended on the Peruvian and Venezuelan embassies in a matter of hours. The Peruvian government initially turned to other Andean Pact countries for assistance in putting together an international relief effort. Castro manipulated events to involve the United States and opened the Mariel port, west of Havana, to allow relatives to come by boat to pick up families. The Cuban population was mobilized to denounce, intimidate, harass, and even attack those who chose to leave. In addition, the Cuban government took advantage of the boatlift to “deport” a sizable number of people considered undesirable (primarily common criminals and persons with mental conditions). For a detailed account of the Mariel exodus, see Larzelere, 1988. According to the State Department’s Coordinator for Cuban Affairs at the time of the 1994 mass sea exodus from Cuba, the 20,000 quota led to confusion on the part of the Cuban government. This was a numerical limit the United States placed on migrants from any single country of the world that was applied to Cubans after the Mariel exodus of 1980. The Cuban government had interpreted this to be a guaranteed amount, yet the number was never reached until then. Ambassador Dennis Hays, Washington, D.C., telephone interview 12/3/03. Presumably, at the time of the 1994 rafters’ crisis, the Cuban government had pent-up frustration regarding an expected level of yearly migrations that had not materialized. 22. Before Castro’s announcement that all who wished to leave could do so, for weeks increasing numbers of balseros had been arriving and were being processed into the U.S. After Castro’s announcement, balseros picked up at sea were sent to the Guantanamo U.S. Naval Base. Hays interview. 23. For more on this, see, for example, Fact Sheet “U.S.-Cuba Relations,” U.S. Department of State, Bureau of Western Hemisphere Affairs, Washington, D.C., May 1, 2001. According to INS statistics, 116,604 Cuban refugees and asylees were granted lawful permanent resident status in the United States from 1991 to 2000. See 2002 Yearbook of Immigration Statistics. For the entire period 1961- 2000, 654,149 Cuban asylees and refugees were granted lawful permanent resident status in the United States. 24. Under the Special Programs for Cuban Migration the U.S. Interests Section in Havana has held lotteries to randomly select winners from among applicants. Qualified winners do not receive visas, but rather receive transportation letters authorizing them to enter the United States under the special parole authority of the United States Attorney General. Certain family members of Cuban visa recipients may receive similar paroles. The U.S. Interests Section is not currently accepting entries to the Cuban lottery. Applicants are currently being processed based on entries submitted in the 1998 lottery, the last one held to date. “The Special Program for Cuban Migration (Cuban Lottery or Sorteo),” U.S. Interests Section, Havana, (http://usembassy.state.gov/havana/wwwhconsvisaivpparoleeng.html) and Immigrant visa/Parole Unit, United States Interest Section, Havana, Cuba, (http://usembassy.state.gov/havana/ wwwhconsvisaivpgeneralinfoeng.html). 25. Executive Order 12807 of May 24, 1992 (signed by President George H. Bush) authorized the U.S. Coast Guard to interdict migrants at sea outside of U.S. territorial waters and return them to their home countries. It also directed the Secretary of State to undertake to enter into, on behalf of the United States, cooperative arrangements with appropriate foreign governments to prevent illegal migration to the United States by sea. This Executive Order followed Executive Order 12324—Interdiction of Illegal Aliens, of September 29, 1981, signed by Ronald Reagan, that had authorized the Coast Guard to interdict migrants in high seas. 26. For more on the 1994 and 1995 Accords, see “Cuba: Migration,” U.S. State Department, and Fact Sheet: Cuba-U.S. Migration Accord, released by the Bureau of Western Hemisphere Affairs. U.S. Department of State, August 28, 2000. 28. The U.S. Coast Guard is given jurisdiction by the government of Bahamas when a member of the Bahamian Navy is aboard a U.S. vessel, and, thus, is able to repatriate to Cuba any balseros found in Bahamian territorial waters. Telephone interview with LTJG Kevin J. Puzder, Office of Law Enforcement (G-OPL), Migrant Interdiction Division, U.S. Coast Guard, November 20, 2003. See, for example, Wilfredo Cancio Isla, “Repatrian a 35 cubanos detenidos en Bahamas,” El Nuevo Herald, 28 de noviembre de 2001. 29. This is authorized by Presidential determination and consultation with Congress. For FY 2002, persons from Vietnam, Cuba, and the former Soviet Union could, if otherwise qualified, be considered refugees for the purpose of admission to the United States within their countries of nationality or habitual residence. See Department of State, Washington File, *EPF501 11/23/2001, Text: Presidential Declaration on Refugees and Migration (Bush authorizes admission of 70,000 refugees in FY 2002) (720), http://usembassy-australia. state. gov/hyper/2001/1123/epf501.htm. 31. United Nations Convention Relating to the Status of Refugees (28 July 1951) 189 UNTS 137 and United Nations Protocol Relating to the Status of Refugees (31 January 1967) 606 UNTS 297. The 1967 Protocol removed geographical and temporal restrictions from the Convention. 32. An important distinction must be made. The principles of non-refoulement and that of asylum are two different principles that can both apply to asylum claimants (as per the Refugee Convention), but are not necessarily applicable in all cases. Asylum is the admission to residence and lasting protection against the jurisdiction of another State and is an exercise of the sovereignty of a State. An individual has no right to asylum and cannot claim that asylum must be given. On the other hand, as per Article 33 of the Refugee Convention, non-refoulement does create an individual right to not be returned to a state where persecution or torture is likely. A State party to the Refugee Convention is under no obligation to grant permanent residence status in the country of refuge or asylum. See Prof. dr. Dirk Vanheule, The Principle of Non-Refoulement in the 1951 Geneva Refugee Convention, Faculty of Law, University of Antwerp, 2002. 33. 141 countries have signed the Convention on Refugees and/or its Protocol. See UNHCR, United Nations High Commissioner for Refugees, States Parties to the 1951 Convention relating to the Status of Refugees and the 1967 Protocol. 34. Convention against Torture or other Cruel, Inhuman or Degrading Treatment (10 December 1984) 1465 UNTS 113. Entered into force on 26 June 1987. Honduras, Mexico, the United Kingdom, and the United States have all ratified the Convention. Bahamas and Jamaica are not signatories. Office of the U.N. High Commissioner for Human Rights, Status of Ratifications of the Principal International Human Rights Treaties as of 7/7/03. 35. Sir Elihu Lauterpracht and Daniel Bethlehem, “The scope and content of the principle of non-refoulement: Opinion,” in Erika Feller, Turk Volker and Frances Nicholson, editors, Refugee Protection in Interntional Law, UNHCR’s Global Consultations on International Protection, U.N. High Commission for Refugees. Cambridge, U.K., Cambridge University Press, 2003, pp. 165–170. 36. Arthur C. Helton, “Applying human rights law in U.S. asylum cases,” International Civil Liberties Report. 2000, http://archive. aclu.org/library/iclr/2000/iclr2000_3.pdf . Also see Walter Suntinger, “The Principle of Non-Refoulement: Art 3 UN Convention against Torture (CAT),” Elena International Course, Strasbourg 27 January 2001. 41. The most obvious exceptions would be individuals who are representatives of the government, the Communist Party, and the state security apparatus. 45. For example, see “illegal exit or piracy” as cause in list of political prisoners by Elizardo Sánchez Santa Cruz, Comisión Cubana de Derechos Humanos y Reconciliación Nacional, “Lista Parcial de Sancionados o Procesados por Motivos Políticos o Sociales hasta Julio de 2003,” Información enviada al Buró de Información del Movimiento Cubano de Derechos Humanos, http://www.infoburo.org/Presos7- 03.pdf. 46. Personal interview with Maribel Alvarez, who attempted to escape Cuba on a raft in 1999, and was apprehended by the Cuban Coast Guard. Now living in New Jersey, she managed to flee on another raft with a group of five friends in July of 1999 and was not returned by the U.S. Coast Guard due to a medical condition. 47. Omar Ruiz, “Balsero devuelto denuncia los maltratos de la policía política cubana,” Grupo Decoro, www.cubanet.org, Santa Clara, 27 de noviembre 2002; and Reinaldo Cosano Alén, “Desempleado por intento de salida ilegal del país,” www.cubanet.org, La Habana, 30 de diciembre 2002. 48. In June 2001, for example, a group of Cuban soldiers who sought to escape by boat was condemned to jail sentences of up to 27 years. “Cuba seeks heavy sentences for military deserters,” Reuters, Havana, June 13, 2001. 49. David Gonzalez, “Cuba Executes 3 Who Tried to Reach U.S. in a Hijacking,” The New York Times, April 12, 2003. 50. At least eighteen men have been executed from 1961 to 1992 for attempting to flee the island by boat, most without resorting to force or any sort of violence (these are known cases, others may exist). One case involves the 1963 execution of three Protestant Ministers, Rev. José Durado (of the Gideon Congregation of Florida, Camagüey), Rev. Pablo Rodríguez (of the Church of God of Güines, Havana Province), and Rev. Antonio González (congregation not reported). They left Cuba by boat as part of a group of 19 asylum seekers and were swept to Anguilla Key, Bahamas, where the Cuban Coast Guard staged a raid, returned them to Cuba, and swiftly executed the three ministers (on October 16, 1963), sentencing the remaining 16 to 5 years in prison. Great Britain sent a diplomatic note of protest to Cuba (on 10/4/63) and The New York Times reported twice on this case (on 10/5/63, p.8, and 10/16/63, p. 5). Telephone interview with Armando Lago. 51. The better documented incidents include: (1) the sinking of the tugboat “13 de marzo” on July 13, 1994, where 44 people (including many children) were purposefully drowned by the Cuban Coast Guard after attempting to steal a ferry; (2) the Canímar massacre of July 6, 1980, when 45 people were machine-gunned to death by the Cuban Coast Guard for attempting to steal an excursion boat; and (3) the Barlovento massacre of January 15, 1962, where 5 people were machined gunned to death and many more were sentenced to up to 20 years in prison for attempting to steal a motorboat. Information provided by Dr. Armando Lago. Many other incidents have been reported over the years, as in “Camagüey: Hunden bote con cubanos,” El Pitirre Digital, 21 de Marzo de 2003. 52. One such case was related to the author by a mental health professional who left Cuba in recent years and had treated a survivor at a state psychiatric hospital This account has not been documented for lack of complete information and fear by the émigré that family still on the island will face reprisal. 53. “The Principle of Non-Refoulement,” Cambridge Roundtable, Organized by the United Nations High Commissioner for Refugees and the Lauterpacht Research Centre for International Law, 9–10 July 2001. 55. Roundtable of experts held in Cambridge, United Kingdom, as part of the “second track” of global consultations on international protection sponsored by UNHCR. Although not formally binding, the conclusions constitute expert expressions of opinion which are broadly representative of the views of the international community. Volker Turk and Frances Nicholson, “Introduction.” In Feller et al., p. 9. 57. See for example, Human Rights Watch, “Background: Refugee Convention Violations,” http://www.hrw.org/press/2001/12/ refconbg1211.htm, and Guy S. Goodwin-Gill, The Refugee in International Law, 2 ed, Clarendon Press, Oxford, 1996, p. 167. 62. Lautherpacht and Bethlehem, p. 114. 63. Lautherpacht and Bethlehem, p. 114. 64. The Refugee Act, enacted March 17, 1980, Pub. L. No. 96-212, 94 Stat. 102. 65. Sale v. Haitian Ctrs. Council, 113 S. Ct. 2549, 113 S. Ct. 2549, 125 L. (92-344), 509 U.S. 155 (1993). 66. The CAA was enacted, as per the legislative record, to provide a mechanism for refugees to escape the political persecution of Communist countries. Authority cited by Congressional Committee report cited similar legislation passed on behalf of Hungarian refugees and other refugees fleeing Communist countries outside of the Western Hemisphere. This policy goal is also thought to be well established in history. In addition, the Cuban Liberty and Solidarity Act of 1996 (also known as the Helms-Burton Law, P.L. No. 104- 208) supports the legislative intent of providing refuge from persecution. It conditions the repeal of the CAA on a determination by the President that a democratically elected government is in power in Cuba. See Roland Estevez, “Modern Application of the Cuban Adjustment Act of 1966 and Helms-Burton: Adding Insult to Injury,” Hofstra Law Review, Vol. 30, No. 4, Summer 2002. 67. See, for example, Reinaldo Cosano Alén, “Desempleado por intento de salida ilegal del país,” La Habana, 30 de diciembre 2002, www.cubanet.org; Omar Ruiz, “Balsero devuelto denuncia los maltratos de la policía política cubana,” Grupo Decoro, Santa Clara, 27 de noviembre 2002. www.cubanet.org; José Antonio Fornaris, “Amenazan con largas condenas a balseros devueltos,” La Habana, 3 de abril 2003, Cuba-Verdad, www.cuganet.org. 68. Statement by Kevin Whitaker, Coordinator for Cuban Affairs, U.S. Department of State, speaking to the press in Havana on the occasion of the Migrations Talks held in accordance with a twice a year schedule as per the 1995 Migration Accord concern. Andrea Rodríguez, “Cuba, U.S. officials hold migration talks,” Havana, Associated Press, December 17, 2002. 69. The talks, held every six months in Cuba or the United States, are the highest-level discussions between the two nations. State Department Spokesman Richard Boucher said the U.S. government wanted to discuss five issues and would consider rescheduling the talks when Havana agreed to them: (1) Cuba’s obligation to issue exit permits to all qualified migrants; (2) Cuba’s cooperation in holding a new registration for the lottery from which two-thirds of all legal migrants are chosen; (3) a deeper port in Cuba for repatriations by the U.S. Coast Guard; (4) permission for U.S. diplomatic personnel to monitor the government’s treatment of repatriated Cubans; and (5) Cuba’s obligation under international law to accept the return of Cuban nationals the United States wishes to deport. Boucher said Washington has raised the critical issues at the last six sessions of migration talks, but Havana officials have refused to discuss them substantively. In October 2003, Cuba sent a diplomatic note saying it rejected discussion of such issues. “U.S. Suspends Migration Talks With Cuba,” Associated Press, Washington, January 7, 2004. 70. Kevin Whitaker, Coordinator for Cuban Affairs, U.S. State Department, Personal telephone interview, January 9, 2004. 72. International Covenant on Civil and Political Rights, G.A. res. 2200A (XXI), 21 U.N. GAOR Supp. (No. 16) at 52, U.N. Doc. A/6316 (1966), 999 U.N.T.S. 171, entered into force March 23, 1976. 76. K. Whitaker, e-mail of 1/12/04. 77. All information on described Coast Guard procedures was provided by LTJG K. Puzder. Fiscal year figures for Cuban migrants medically evacuated by the U.S. Coast Guard: 1995: 3, 1996: 14, 1997:8, 1998: 28, 1999: 23, 2000: 28, 2001: 2, 2002: 7. Source: “Maritime Migrants Medically Evacuated by the Coast Guard,” Migrant Interdiction Statistics, U.S. Coast Guard, Alien Migrant Interdiction, Coast Guard Office of Law Enforcement, www.uscg.mil. 81. Index of Economic Freedom. 82. Index of Economic Freedom. 83. Ackerman and Clark, pp. 31-32. 86. V. Turk and F. Nicholson, “Introduction,” in E. Feller, et al., p. 6. 88. The problem is particularly challenging for the United States, which has received hundreds of thousands of Cuban refugees since 1959 and is constantly faced with the threat of a mass migration crisis as political blackmail by the Castro regime. The Mariel Boatlift of 1980 put enormous strain on resources, particularly on the U.S. Coast Guard, which was faced with a sudden security and humanitarian crisis. Numerous federal and state agencies were involved and the Florida was declared under a state of emergency. The cost to the Coast Guard alone reached an average of $650,000 a week, or $16.5 million for the duration of the event; 1,387 vessels had to be assisted by the Coast Guard in a frantic operation to save lives. Nonetheless, at least 27 lives were lost in maritime accidents. U.S. Coast Guard, Alien Migrant Interdiction, Coast Guard Office of Law Enforcement, “Mariel Boatlift.” For a superb account of Coast Guard operations during the Mariel boatlift, see A. Larzalere. 90. Although the CAA itself does not refer to the reasons for its passing, the legislative history surrounding the Act clearly contains references to providing a mechanism for refuges to escape the political persecution of Communist Cuba as an underlying motive behind its enactment. In addition, history is said to support this legislative intent, as for example, reflected in the Cuban Liberty and Solidarity (Helms-Burton) Act of 1996, that conditions the repeal of the CAA to a determination by the President that a democratically elected government is in power in Cuba. See Estevez. 91. “Más de 23.000 cubanos recibieron visas de EEUU en año fiscal 2004,” EFE, La Habana, 1ro de octubre del 2004. 93. The U.S. Coast Guard is only allowed into the port of Cabañas, which can only take patrol boats -110 foot cutters- for refugees to be taken back. Refugees picked up at sea are transferred to larger ships, where better conditions can be provided for their stay. For the repatriation, they must be transferred in high seas back to patrol boats, posing security and logistical problems aside from increasing the operational cost. Cuba refuses to discuss allowing USCG access to deeper ports. K. Whitaker. 94. Lotteries were held in 1994, 1996, and 1998. In 1998, however, presumably as people inside the island became more familiar with the process, 541,000 Cubans registered for the lottery in the first 30 days. The Cuban government asked that it shut down, as it had become a source of great embarrassment to them. Since then it has insisted even in writing that it will not allow another lottery (K. Whitaker). 95. Some Cuban nationals who apply for this program qualify for admission as refugees and some as legal permanent residents; the rest are paroled consistent with the Agreement. Potential parolees are selected for interview in Cuba by lottery. Their backgrounds are screened according to U.S. immigration law to exclude persons with criminal records and certain medical conditions, and those who are likely to become public charges. Successful applicants must answer yes to two of three questions: Do you have relatives in the United States? Do you have at least 3 years of work experience? Do you have at least a secondary education? Barbara Robson. “The Cubans: Their History and Culture,” Refugee Fact Sheet Series No.12, The Refugee Service Center, Washington, DC, 1996. 96. Cuban official data on remittances is lacking and estimates by experts vary widely. 97. In fact, from 1992-96, remittances are reported to have grown by 242%, at ten times the rate of tourism revenues, considered the most dynamic sector of the Cuban economy. Pedro Monreal, “Las remesas familiares en la economía cubana,” Revista Encuentro de la Cultura Cubana, Vol. 14, otoño del 1999, pp. 49-62. Monreal is an economist at the Centro de Investigaciones sobre la Economía Internacional (CIEI) in Havana. 98. Monreal well points to the difficulty of obtaining adequate data on remittances and assumes they reached around $500 million, rather than the reported $800 million by the United Nation’s Economic Commission on Latin America. Over the years estimates from different sources and experts have varied considerably. 99. The average wage in Cuba in 2001 was 245 pesos, and the average monthly income of workers 349 pesos, which takes into account other compensation such as bonuses in hard currency convertible pesos, food support, clothing, shoes, toiletries and other consumer items (Oscar Espinosa Chepe, “El salario en Cuba,” CubaNet, Havana, July 2002). That translates into US$9.42 and US$13.42, respectively, at the current exchange rate of 26 pesos to the dollar. 100. Armando Soler, “Lo que cuesta salir de Cuba,” La Habana, CubaNet, julio del 2002, http://www.conexioncubana.net/tramites/ emigracion/salir.htm. 101. Approved immigrant visas since the 1994-95 migration accords were put in place (excluding immediate relatives that are counted separately): FY95, 25,838; FY96, 20,006; FY97, 20,048, FY98, 20,787; FY99, 24,149; FY00, 20,566 (as of 8/21/2000). The figures for FY96, FY97, and FY98 include a credit of 5,000 (per year) assigned to refugees interned at the U.S. Guantánamo Naval Base who were allowed into the U.S. The fiscal year ends on September 30. “Fact Sheet: Approved Cuban Migrants,” U.S. Department of State, Bureau of Western Hemisphere Affairs, August 28, 2000. 2000. www.state.gov/www/regions/wha/cuba/ fs_000828_cuban_migrants.html. By July 2004, the U.S. had already filled the 20,000 visa limit for FY 2004. “Fulfillment of USG Obligation to Issue 20,000 Travel Documents.” Press Statement by James C. Cason, Chief of Mission U.S. Interests Section, Havana, Cuba, July 19, 2004, <http://usembassy.state.gov/havana/wwwh2vce.html>. For FY 2004 (ending 9/30/04), the U.S. granted 23,075 immigrant visas to Cubans. “Mas de 23.000 cubanos recibieron visas de EEUU en año fiscal 2004,” EFE, La Habana, 1 octubre 2004. 103. Maria C. Werlau, “U.S. Travel restrictions to Cuba: Overview and Evolution,” Cuba in Transition—Volume 13. Washington: Association for the Study of the Cuban Economy, 2003, pp. 407-409. 104. U.S. Cuba Policy Report, September 30, 2003. 106. According to the 2000 U.S. Census, almost 50% of the U.S. population describing itself as Cuban American was born on the island. See T. Boswell. For an interesting survey on the attitudes of Cuban émigrés to the U.S. of the 1990s, see Silvia Pedraza, “The Last Wave: Cuba’s Contemporary Exodus, Political or Economic Immigrants,” Cuba in Transition—Volume 10. Washington: Association for the Study of the Cuban Economy, 2000. Pedraza concludes that, despite the differences in historical and emotional contexts of the distinct emigration waves since 1959, there is an underlying political disaffection that permeates all immigrant waves and cuts across socio- economic and other characteristics. 107. Ackerman and Clark. Also see www.uscg.mil and New York State Archives Legacy Project, “Cubans in America: Push and Pull Factors of Immigration,” Document 5: Excerpt from President Jimmy Carter’s press statement, 14 May 1980; and Robson. 108. V. Turk and F. Nicholson, in E. Feller et al., op.cit., p. 37. 109. V. Turk and F. Nicholson, in E. Feller et al., op.cit., p. 37. 110. As we have seen, the Cuban government has, on several occasions, removed restrictions on leaving the country, a situation that has caused tens of thousands to seek asylum in a very short period. See “Cubans in America: Push and Pull Factors of Immigration;” Robson.